Hooters Las Vegas Casino has signed a letter of intent to be purchased by NTH Advisory Group LLC, an investment group, for $95 million in cash and payment of some royalties. Hooters Casino Las Vegas, Nevada real estate has only been open for one year. NTH real estate investors would be responsible for any related costs of the sellers’ $130 million of 8 3/4% Senior Secured Notes due 2012. NTH has a deposit of $1.1 million in a real estate escrow account by Feb. 12, 2007. The deal could be canceled for any reason during the inspection period. 155 East Tropicana LLC, is the owner of Hooters. This is a partnership of Florida Hooters LLC and EW Common LLC. The CEO of 155 East Tropicana LLC, Neil Kiefer, says the buyout offer was unsolicited and will provide an attractive return to the company’s owners. The hotel in Las Vegas, Nevada real estate has been unable to maintain an average hotel occupancy of 95% for Las Vegas hotels. The Las Vegas hotel was formerly known as Hotel San Remo Casino. Hooters Las Vegas is located a half a block from Vegas Boulevard. Stardust Las Vegas real estate set for mid March implosion to make way for the luxury resort Echelon Place Las Vegas. The Stardust hotel in Las Vegas, Nevada has had most of its windows and internal workings removed. Now you can see right through the property. Hotel implosion is scheduled to take place in the middle of March sometime during the early morning. 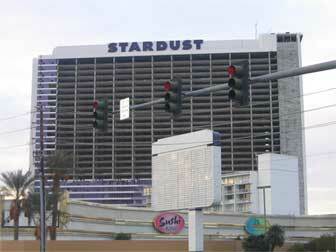 The Stardust was a 1,500-room casino, 48-year-old property located on the Las Vegas Strip. Boyd Gaming isn’t letting the public know the exact time for crowd control purposes. Echelon Place Las Vegas real estate will be an 80-acre development. Echelon Place real estate total development expenditure is a $4-billion complex of casinos, hotels, shopping and entertainment venues that is scheduled to open in 2010. The Las Vegas resort plan includes four hotels with 5,300 rooms, a 140,000-sf casino, a shopping promenade, theaters, convention space and spas. • $1.8 million, Seven Hills Real Estate, 4,755 square feet, 5 bedrooms, 5.5 baths, two thirds acre, Mediterranean-style, four-car garage, fire pit, pool, spa, entertainment center with five built-in plasma TVs. • $1.23 million, Red Rock Country Club Real Estate, 4,200 square feet, 3 bedrooms, 3.5 baths, 20-foot ceilings in living room, 16th green location, lighted golf course and mountain views, three walk-in closets in master.